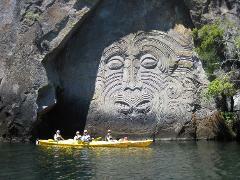 Come out with us and explore the secluded Rock Carvings at Mine Bay. Paddle below native bush, past steep cliffs and mini inlets that can only harbour a kayak before the amazing 14 metre-high carvings come into view. Gently paddle through the un spoilt beauty of the Waikato River, through the pumice gorge with crystal clear slow moving water. Be amazed by the stunning cliff faces and lush native forest. 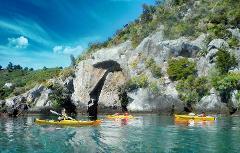 Summer special - Get 10% off our Kayak to the Maori Rock Carvings tour if you book with 3 people or more making it only $10pp. Normally $110pp. Special ends 31 December 2018. Our Explorer package is without a doubt the best way to experience the spectacular scenery from the Great New Zealand Cycle Trail, and phenomenal views of the stunning Lake Taupo region. 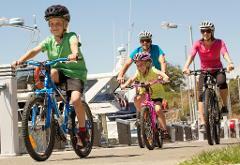 Ride the Lakefront's Lions Walk/Great Lake Walkway (Grade 1) to the Yacht Club where we changeover to the kayak journey to Acacia Bay. Ride the Great Lake Trail starting at Orakau Stream. Generally a downhill trail with stunning views. 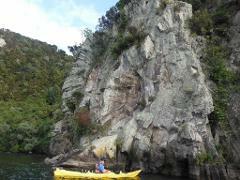 At Kawakawa Bay, transfer to your kayak for an easy 2 hour paddle back. This one's truly for the adventurous! Kick off your day riding sections of the Great Lake Trail down to Kotukutuku Stream. 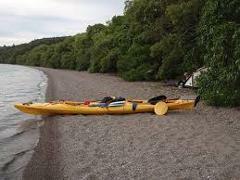 Then transfer to kayaks for a 3.5 - 4 hour scenic paddle. 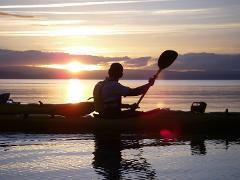 Come and fish beautiful Lake Taupo out of purpose-built fishing kayaks Fish for Rainbow Trout, and the odd trophy Brown, while enjoying the serenity that only kayaking provides. Mason's Rock Explorer Package is without a doubt the best way to experience the spectacular scenery from the Great New Zealand Cycle Trail, and see the Mason's Rock - which resembles a fantails tail by water. Our Maori Carvings Explorer package is without a doubt the best way to experience the spectacular scenery from the Great Lake Trail, and see the amazing Maori Rock Carvings at Mine Bay by water. 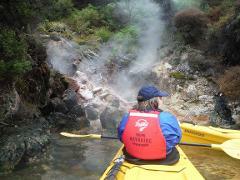 This trip is perfect for those wanting to experience the geothermal wonders of New Zealand up close by starting with a kayak adventure along the Waikato River down toward the hidden valley of Orakei Korako Geothermal Park. Ride the Rotary Trail from Spa Park to the most visited natural attraction in New Zealand, Huka Falls, and continue on to Aratiatia Dam to see the dam gates open. 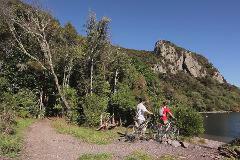 Mountain biking is a great way to explore the region on 2 wheels. The Orakau and K2K section of the Great Lake Trail is a great ride through various landscapes from wetlands to native bush.